Amazon rainforest is one of the biggest rainforest that covers most South America. The amazon basin covers almost 7,000,000 Sq. Kilometers. 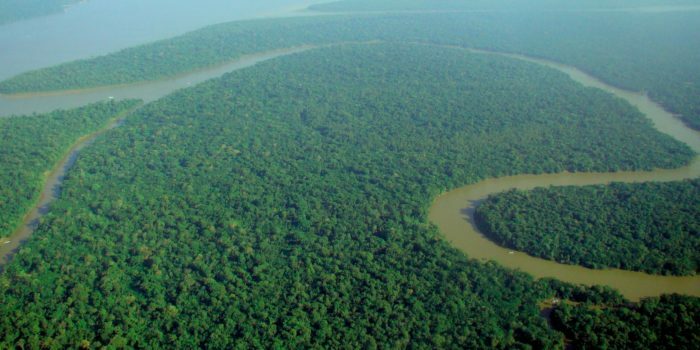 The amazon forest belongs to 9 different nations. The most part of it is in Brazil that covers almost 60% of total rainforest. Peru, Colombia, Venezuela, Bolivia, Ecuador, Guyana, French Guiana, Suriname are the other nations that have some part of this forest in their territory. This rainforest of amazon is half of the total rainforest in the world and it is tropical rainforest that have almost 390 billion trees in it. It is one of the best place to visit as there are many natural wonders exist in this part of the world. The rainforest is developed in Eocene regime. It is said that rainforest is formed 55 million years ago. As per archaeological evidence it is believed that human settled in this part of the world is about 11200 years ago. Since start, it is believed that this rainforest don’t have any human inhabitants due to poor cultivation (agriculture) and soil. According to Betty Meggers, she put an idea on her book that only 0.2 inhabitants per Sq. Km can exist in rainforest and they are dependent on hunting rather than agriculture. This rainforest due to tropical climate is unparalleled biodiverse. You can say it has got about 2000 different species of mammals and birds, thousands of different plants, 2200 different spices of fish, 378 reptiles, and 428 amphibians are scientifically classified in this part of the world. Deforestation in this area has started in 1960’s and the major source of deforestation is because of human development and settlement in this area. At start human entire was restricted but afterwards slash and burn method allow people to cultivate crops in this area. However still the land is not suitable for cultivation as the soil in this area is productive for very less time period. Trans-Amazonian Highway was started in the year 1970 and it was one of the biggest threats to this forest. Fortunately this project hasn’t been completed and there was less damaged caused to the rainforest. The environmentalists are very much concern about the reduction in biodiversity, the main reason of less biodiversity is damage to the forest. There is a lot of carbon released that is in vegetation, it can also become cause of increasing global warming. If you love nature you must visit this part of the world once.